Description: This plant is, of course, not a pear. It is in fact a cactus. 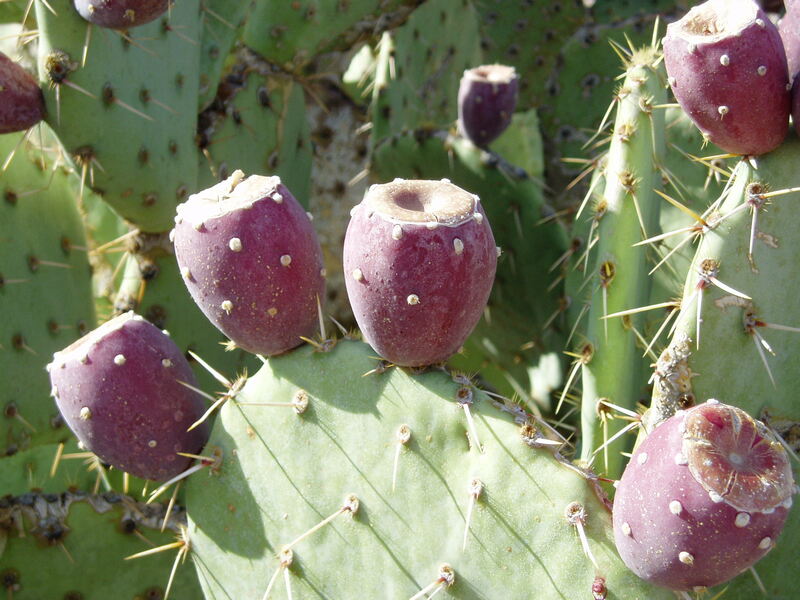 Prickly Pear is the name of a number of cacti plants which have jointed pads and edible fruit. It may be a small single pad plant or a large 'bush' made up of hundreds of attached pads. These plants produce large showy flowers and delicious looking fruit. The fruit is quite edible, but watch out for the spines. Edibility: The fruit flesh is edible, if you can get to it. Harvesting involves simply pulling the fruit off, or in some cases knocking it off the plant with a stick. There are soft spines on the fruit which can be removed by rubbing it with a damp cloth. It can then be peeled and eaten. It is full of black seeds, which should be discarded. The flavor and texture is somewhat reminiscient of watermellon, thought the sweetness varies by species.